The minimum wage in Bangladesh's garment industry is equal to just US$67 a month. This wage has been fixed since 2013 and is not due to be reviewed for at least another year. Meanwhile the cost of living has increased dramatically: over 6% per year since 2013. Workers who already couldn't cover basic expenses on these low wages are now struggling even harder to survive. In December, with no other route for raising their frustrations and demands, workers at dozens of factories held peaceful walk-outs and demonstrations for a higher wage. Instead of agreeing to pay a living wage, or even to bring forward a wage review, factory owners brought unsubstantiated criminal charges against dozens of labor leaders and garment workers. At least 34 activists and workers have been arrested, and as of February 20, five of them still remain in police custody or jail. Some have received threats of torture or death. Many are being charged under a section of law that has already been removed from the statutes. These charges also include hundreds of "unnamed" workers, allowing factory owners to simply add workers they see as troublemakers to the list whenever they wish. Over 1500 workers have been reportedly dismissed from their jobs and potentially blacklisted from future garment work. 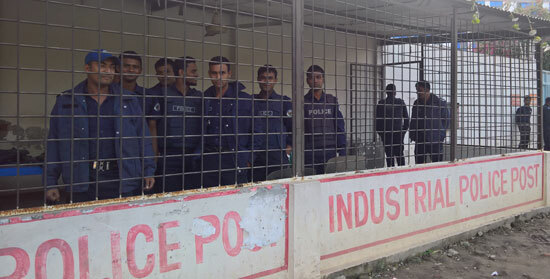 Please sign the petition to call on brands whose clothes are made at the factories behind the complaints to take immediate action for the dismissal of the falsified charges and the release of the jailed activists and workers! This petition will be delivered to H&M, Gap Inc (owns Banana Republic and Old Navy), Inditex (owns Zara and Bershka), and VF (owns 30 brands including North Face, Jansport, and Lee), which source from the factories pressing the charges.